In this post we have gathered together 35 high quality responsive portfolio WordPress themes that will showcase your work projects. Adapt is a free WordPres theme created by WPExplorer.com that features a very clean and elegant business/portfolio style design that is also fully responsive. Overall the theme is very minimal and super easy to setup. It comes with built-in post types for your portfolio, homepage highlights and homepage slider, so adding your content is a breeze. There are page templates for your blog, filterable portfolio, full-width pages and even a landing page template. “Touchfolio” is simple theme created with focus on content and providing great user experience on majority of desktop and mobile devices. 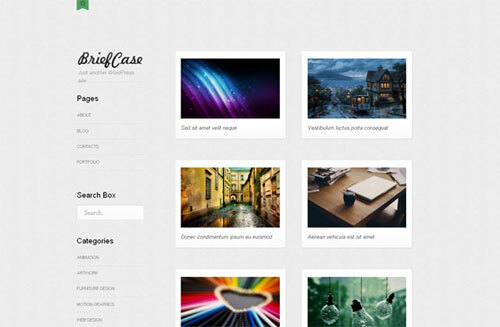 Briefcase is a portfolio based free WordPress theme that could be used for a lot of purposes, beginning from a portfolio and gallery site and finishing to a blog and magazine one. 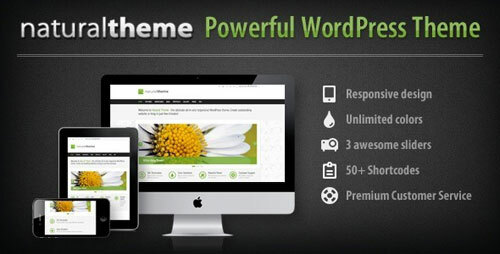 The theme use WordPress 3 features like Custom post types, Custom taxonomies, Custom menus , featured thumbnails etc. 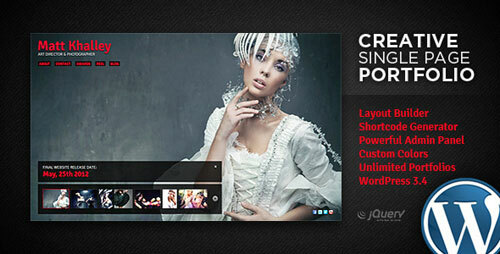 This will be a n ideal theme for professionals to exhibit their portfolio in style. Pronto is a very clean and minimal jQuery Masonry WordPress theme that’s perfect for showcasing your posts in a grid like fashion, that will re-adjust depending on your visitors browser size. 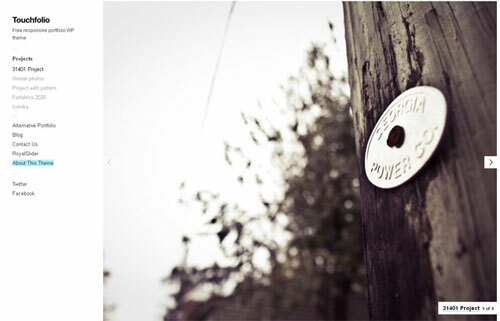 Everything is set to work right out of the box, simply install, add your posts and you are set. The theme includes an awesome notification region at the top for displaying important notices, a custom logo upload field, a custom flickr widget, threaded comments, light-box built-in…and some other sweet features. 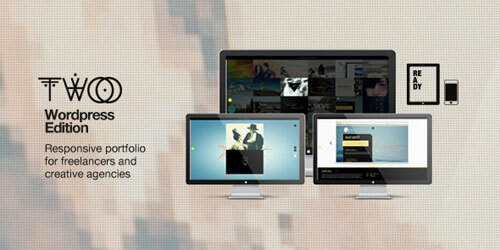 Imbalance 2 turns you WordPress-based website to an attractive blog, portfolio or even online magazine. This free template designed in strict modern style with a minimalistic touch. 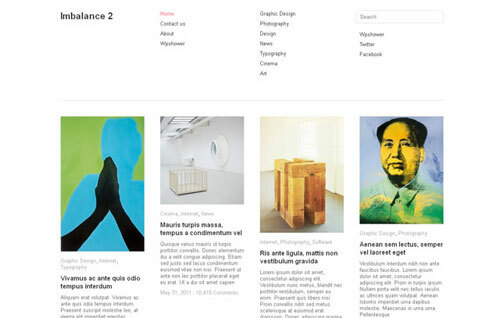 Imbalance 2 can easily fresh up your web-magazine or blog. Due to modern flexible features and layout Imbalance 2 fits to almost any project and your visitors won’t remain indifferent. 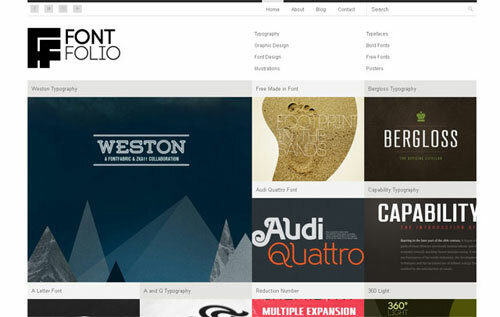 A free minimal & responsive portfolio theme ideal for graphic designers or photographers. 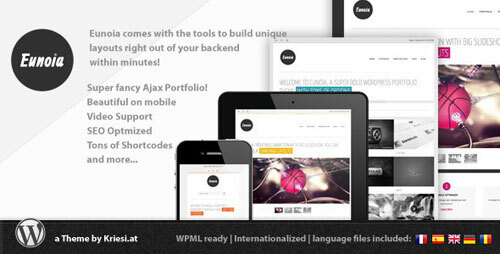 Pure II is absolutely stylish WordPress theme with minimal and clean layout and great typography. 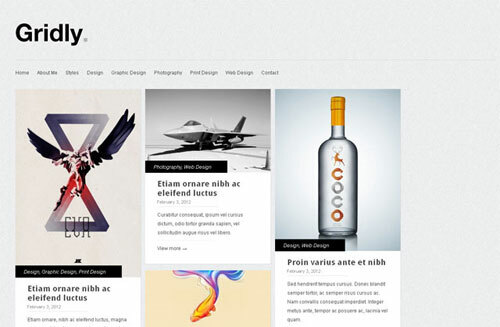 Free WordPress Themes with minimal and modern style. 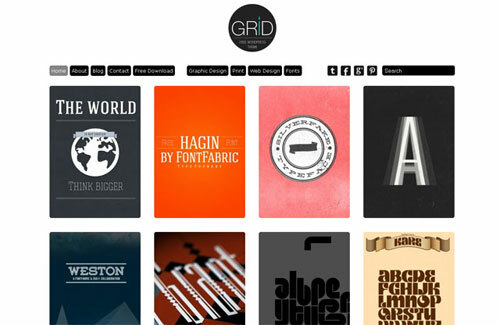 Design for illustrators, photographers and graphic designers. The focus should be on your Artwork not the theme. Agera is a beautiful portfolio. Easy to setup, enhanced with Massive Panel and custom shortcode wizard which makes adding shortcodes extremely easy. 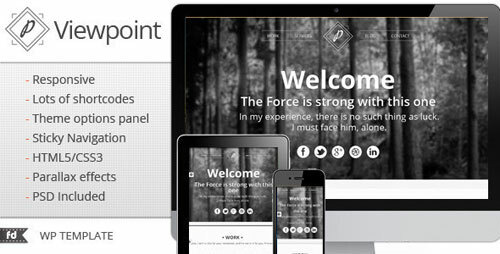 Viewpoint is a single responsive portfolio wordpress theme with parallax effects. Perfect to promote your work or your business. Is compatible with all modern mobile devices. Eunoia is a bold responsive WordPress Theme (try resizing your browser), suited for business websites and users who want to showcase their work on a neat portfolio site. Egofolio is not the exception and will let you use tons of creative shortcodes into your own pages in order to offer a rich experience to your theme users. 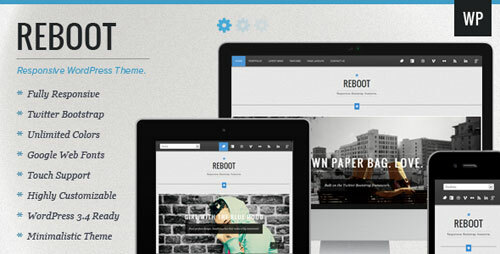 Gap is a Responsive Premium WordPress Theme built on a powerful framework. 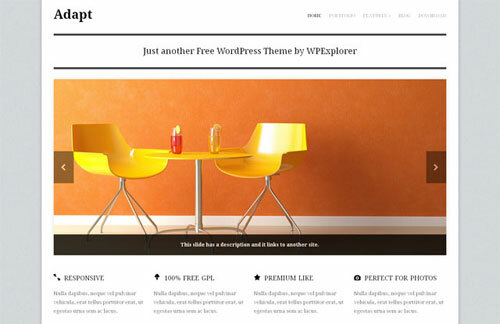 Whether your a WordPress advanced user or just a beginner, you’ll have absolutely no problems working with this theme. The Theme Options is very clear and easy to use! Reboot is a beautifully minimal, and awesomely responsive WordPress Theme, built on the fantastic Twitter Bootstrap that is perfectly suited for Agencies, and Creatives (Designers, Photographers, Motion Artists). Genius is a RESPONSIVE SLIDE Worpress Theme that is great for all types of pages (business, personal, agency, corporate, ... ). The design is very clean and contains all features of a modern web page. 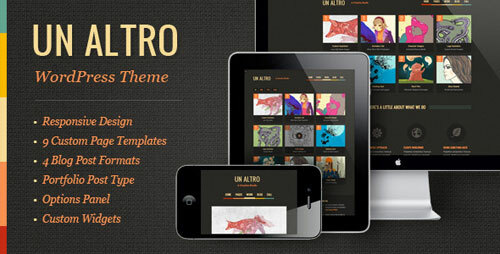 Un Altro is a modern and clean WordPress Theme. It is a creative centric, stylish portfolio that features a responsive design for any screen (desktop, tablet or mobile phone). This theme brings a lot of features: Layout Builder, Slider Manager, Powerful Admin Panel, Menu Manager, SEO Optimized (even with AJAX ), Unlimited Color Schemes and much much more! 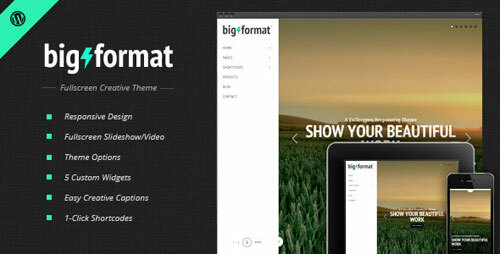 BigFormat is a fullscreen responsive portfolio theme for freelancers, web designers, photographers and videographers alike, built to showcase your work at a large scale. 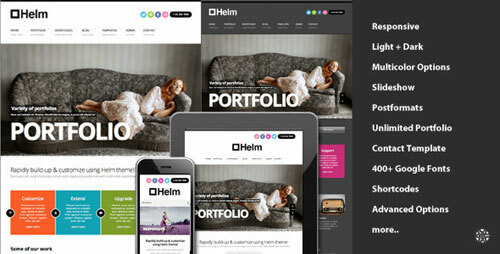 Helm is a responsive portfolio theme for creative professionals. 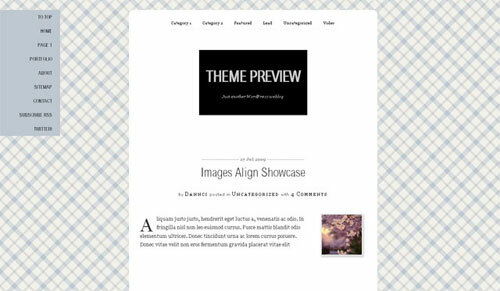 Theme is capable of displaying blog list and posts in fullwidth and 2 column layouts.The theme is packed with showcase solutions including shortcode thumbnail generations that supports multiple image drag and drop capability. 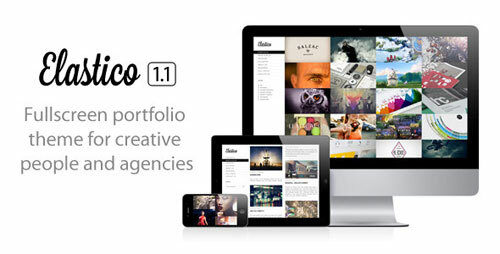 Daisho is a portfolio solution for creative professionals and companies looking for a minimal and professional look. 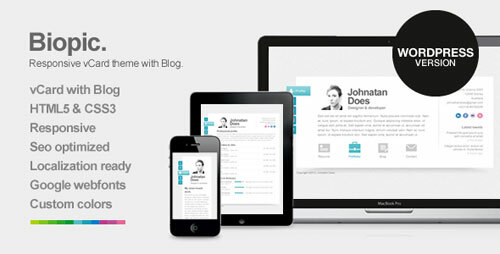 Flexible and responsive presentation, smooth navigational flow and clutter-free approach. Put your works in focus. Powerful Typography Plugin included. 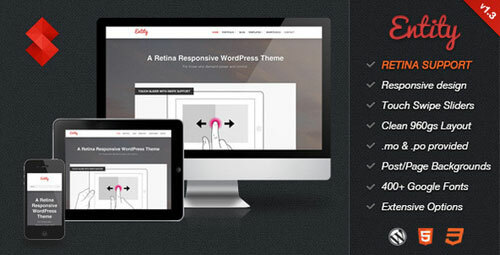 Entity is one of the first themes on ThemeForest to support High Res Retina Displays, such as the iPhone 4/4s and the “new iPad”. The theme is set up to download hi-res versions of the image when a high-res device is used, and you can even set it to only do so when the device’s network speed is fast enough. Biopic is a minimalist, elegant and responsive vCard wordpress theme which is suitable for using it as a vcard, small personal portfolios, photographers, wedding journals etc. 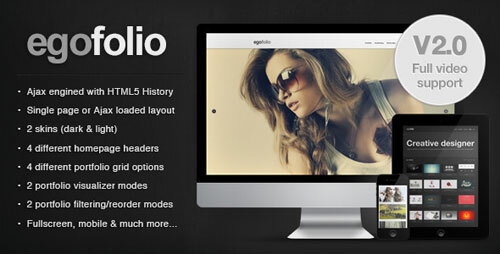 Folio Two Wordpress theme is an advanced portfolio focused to creative freelancers and agencies, a practical and usable wordpress theme designed with HTML5 + CSS3 and using jQuery to enhance an awesome user experience.This template is a powerful tool based on RESPONSIVE DESIGN , adaptive to any kind of device. The screen size will not be a problem to show your favorite works. 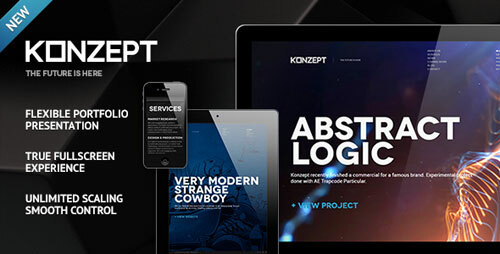 KONZEPT is a portfolio solution for creative professionals of refined taste. 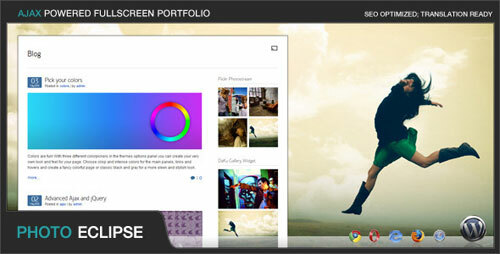 Extensive control options, responsive behavior, fullscreen experience and clutter-free approach put your works in focus. 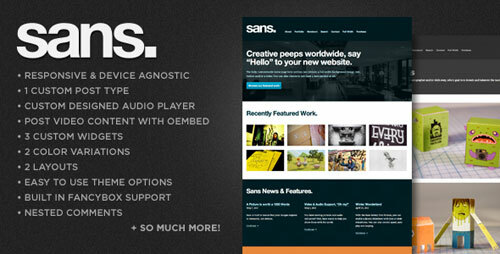 Sans is a responsive WordPress portfolio theme designed and developed for today’s savvy creative. Complete with audio and video support, this theme gives you the tools to easily manage and publish your work so you can concentrate on what you are best at… being creative. 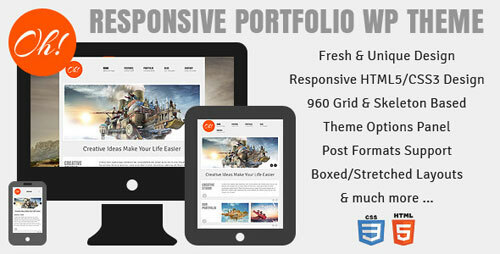 Oh Responsive Portfolio is a powerful HTML5 & CSS3 WordPress Theme. It is one-of-a-kind design with limitless potential and flexible layout.You can hardly find any other template design with more multi-functional and extensible design than this one. Oh! 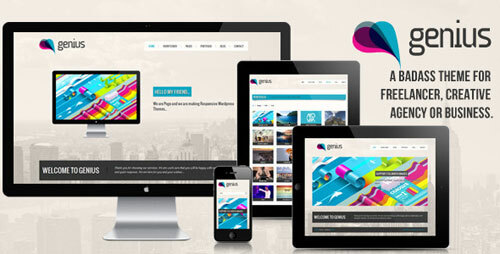 template is designed in accordance with 960 pixels grid and is perfect for building responsive websites. Natural Theme is a responsive Premium WordPress Theme with a powerful, but easy to use, Admin Panel and near endless customization possibilities. You can create a corporate website, a personal portfolio or a professional looking weblog in just a few minutes. Create stunning portfolio posts within no time and place them where ever you want, with the new Daku Portfolio Shortcode Generator. 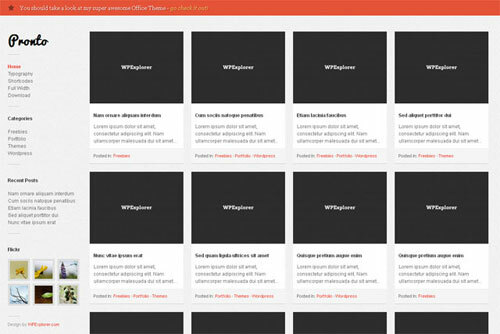 Choose from 3 different collumn templates, sort them by category and use the optional heading for better readability. 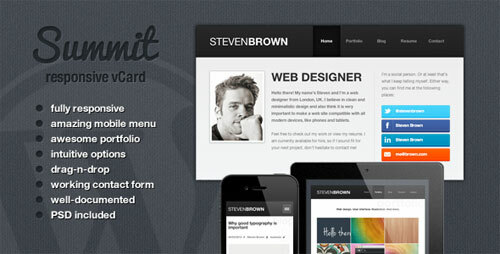 Summit is a premium, clean and responsive vCard theme, featuring an awesome portfolio, a nice blog and resume and a working contact form. 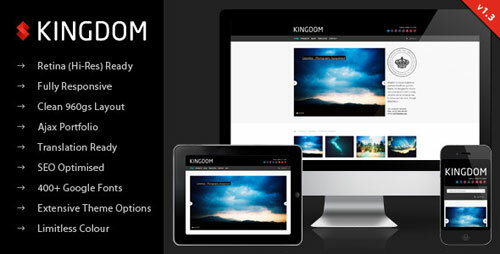 Kingdom is one of the first themes on ThemeForest to support High Res Retina Displays, such as the iPhone 4/4s and the “new iPad”. 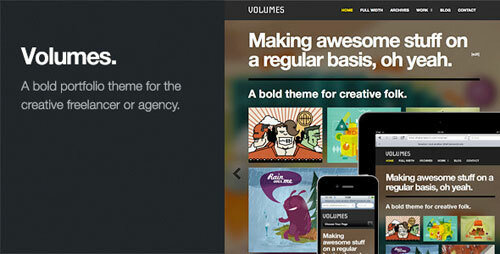 Bold, beautiful, full of character and fully responsive – Volumes is a great asset to any creative freelancer or agency. An attractive showcase for you work packed full of features, a filterable portfolio, custom widgets, custom page templates and more. 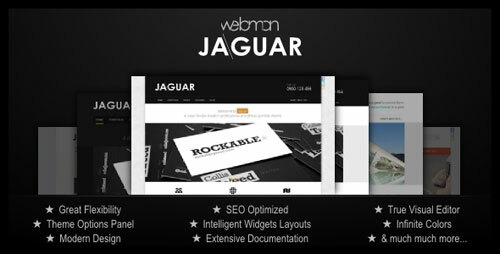 Jaguar uncovers suprisingly simple and creative way of editing WordPress websites. It is fun to work with and offers great flexibility both on front- and back-end side.